(Nanowerk News) In fossil remnants of iron-loving bacteria, researchers of the Cluster of Excellence Origin and Structure of the Universe at the Technische Universitaet Muenchen (TUM), found a radioactive iron isotope that they trace back to a supernova in our cosmic neighborhood ("Supernova left its mark in ancient bacteria"). This is the first proven biological signature of a starburst on our earth. The age determination of the deep-drill core from the Pacific Ocean showed that the supernova must have occurred about 2.2 million years ago, roughly around the time when the modern human developed. Oceanic sediment contains an iron isotope that ancient bacteria accumulated 2.2 million years ago when debris rained on Earth from a supernova explosion. Shown are the remnants of a much younger supernova remnant, Cassiopeia A, shown in a composite image from three NASA observatories. 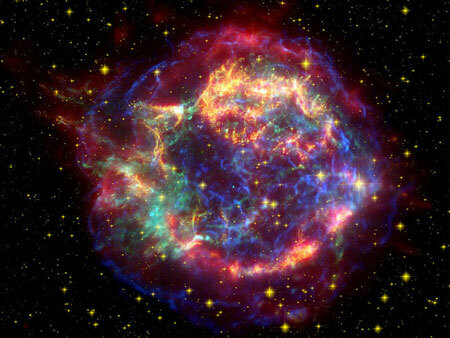 Most of the chemical elements have their origin in core collapse supernovae. When a star ends its life in a gigantic starburst, it throws most of its mass into space. The radioactive iron isotope Fe-60 is produced almost exclusively in such supernovae. Because its half-life of 2.62 million years is short compared to the age of our solar system, no supernova iron should be present on Earth. Therefore, any discovery of Fe-60 on Earth would indicate a supernova in our cosmic neighborhood. In the year 2004, Fe-60 was discovered on Earth for the first time in a ferromanganese crust obtained from the floor of the equatorial Pacific Ocean. Its geological dating puts the event around 2.2 million years ago. Finally, using the ultrasensitive accelerator mass spectrometry system at the Maier Leibnitz Laboratory in Garching, Munich, they found a tantalizing hint of Iron-60 atoms occurring around 2.2 million years ago, which matches the expected time from the ferromanganese study. “It seems reasonable to suppose that the apparent signal of Fe-60 could be remains of magnetite chains formed by bacteria on the sea floor as a starburst showered on them from the atmosphere”, Shawn Bishop says. He and his team are now preparing to analyze a second sediment drill core, containing upwards of 10 times the amount of material as the first drill core, to see if it also holds the Fe-60 signal and, if it does, to map out the shape of the signal as a function of time.